Who’s Trying to ‘Annihilate’ the GOP? When John Boehner whined last week that Obama’s goal for his second term is to “annihilate the Republican Party” and “shove us into the dustbin of history,” he was working the party into a psychological state much like James Franco had to in 127 Hours: They’re getting ready to accept that they will have to sequester their arm with a dull knife. Of course, Obama’s War on the GOP is about as real as the liberals’ War on Christmas—both are paranoid, apocalyptic fantasies marketed to drum up fear and self-pity on the right. Obama telling Republicans to “Please proceed” is no more tantamount to annihilating the GOP than chirping “Happy Holidays” is to eliminating Christmas. Instead, this is a classic case of psychological projection. Paul Ryan, Newt Gingrich, Frank Luntz, and senators Bob Corker, Tom Coburn and Jim DeMint, among other right thinkers, actually held a meeting the night of the 2009 Inaugural to plot to undermine Obama’s newborn presidency with nonstop obstructionism. The next year, Mitch McConnell said, “The single most important thing we want to achieve is for President Obama to be a one-term president.” And yet, after these plans failed to block Obama’s re-election and instead cost the GOP a number of House and Senate seats to boot, here is Boehner saying his party is the victim of existential aggression. Paranoid projection—whether subconscious or deliberate—is part and parcel of the GOP’s broader denial of so much of contemporary reality, whether it’s climate change, demographic change, macroeconomics or polls that don’t go their way. But mostly, they deny who that black man claiming to be president really is. And so they’ve created an Imaginary Obama, who is just as crazily radical as the Ryan budget would be, if it were passed, or as Bush’s war in Iraq actually was. In one of the funnier attempts to portray Obama’s insidiously well-cloaked but devastatingly destructive nature, Breitbart.com wrote that by supporting gay rights in his Inaugural speech, the president had “bullied” the Supreme Court justices on the dais into going gay-friendly in their upcoming decisions. It’s a short step from believing that Obama wants to decimate your party to believing he’s making your party choose hard-right fringe policies that will alienate voters. And as Jonathan Chait writes, moderate Republicans like David Brooks and former Bush speechwriter Michael Gerson, who resent the extremists but won’t break from their party, are particularly susceptible to this “pathological” notion. The prevalent expression of this psychological pain is the belief that President Obama is largely or entirely responsible for Republican extremism. It’s a bizarre but understandable way to reconcile conflicting emotions—somewhat akin to blaming your husband’s infidelity entirely on his mistress. In this case, moderate Republicans believe that Obama’s tactic of taking sensible positions that moderate Republicans agree with is cruel and unfair, because it exposes the extremism that dominates the party, not to mention the powerlessness of the moderates within it. Brooks asserts, but does not actually explain, that Obama chose these issues for the purpose of dividing the opposition—as opposed to trying to cut down on mass murders and fix a huge field of broken policy. What Obama does do, by being a politically moderate and emotionally calm leader with a beautiful family, is hold a mirror up to the chaotic and hysterical Republican leadership. This strikes them as very mean, and they blame Obama for what they see, Man of La Mancha style. So now they are struggling to dream an Impossible Dream: taking back the political momentum by simply agreeing to the “poison pill” plan that the sequester was supposed to be, cutting $1.2 trillion from the budget spread equally between defense and domestic spending. The corporate end of the party will scream at those cuts, and fear the economic impact of austerity; the ultra base, now increasingly gerrymandered into scarlet congressional districts with little incentive to compromise, would get, given the $1.2 trillion Obama has already agreed to cut from the budget, something like the Ryan budget’s $2.4 trillion in spending cuts over the next 10 years. "I think the sequester's going to happen,” Ryan said today on Meet the Press. 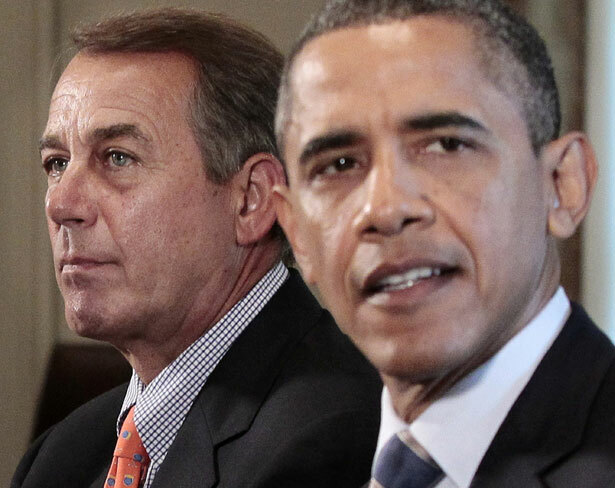 Is Obama in denial about Republican obstructionism? Read Rick Perlstein's take on the president and how his upbringing in Indonesia might have affected his personality.